Twenty-first-century learners have expectations that are not met within the current model of higher education. With the introduction of online learning, the anytime/anywhere mantra taken up by many postsecondary institutions was a first step to meeting learner needs for flexibility; however, the choice and determination of delivery mode still resides with the institution and course instructors. Recently, the massive open online course (MOOC) movement has been introduced as an undeniable force in higher education, and the authors argue that it is distracting leadership from focusing on alternative options for supporting the needs of learners who demand both personalization and real access to learning opportunities. The key element to the MOOC movement is its openness that enables student access to education. In this article, the authors present the multi-access learning framework that envelops the MOOC phenomenon and merges course access modes enabling student choice and agency. The authors report results from a pilot study on one type of multi-access course, where students were able to choose their mode of access. In this case, remote students accessed the course via webcam and joined their on-campus classmates and instructor who were together face-to-face. Implications for multi-access learning in relation to the MOOC movement are discussed. Twenty-first-century learners have expectations that are not met within the traditional model of mainstream higher education (Castle & McGuire, 2010; Jean-Louis, 2011; Siemens, 2005). Further, as cutbacks to educational budgets continue, and centralized professional development opportunities decrease along with them, it will be difficult for universities to keep up with expectations and demands of students. Dialogue has begun to emerge on the future of higher education. Within this context, the massive open online course (MOOC) has been introduced as a movement that threatens to fragment higher education (Daniel, 2012; Friedman, 2013; Harden, 2013; Kolowich, 2013). With this dialogue and administrative attention directed toward MOOCs, it may be distracting higher education leadership from focusing on alternative options for supporting the needs of learners who demand both personalization and access to learning opportunities. "Universities and academics are, as always, faced with choices about how to change, and these choices need to be better informed about the kinds of students that are entering [our] institutions" (Jones, Ramanau, Cross, & Healing, 2010, p. 731). Postsecondary institutions (PSIs) are moving toward learner-centered designs, shifting focus to process and not product. For example, 47 European nations who are members of the Bologna Process have adopted the Budapest–Vienna Declaration on the European Higher Education Areacalling for reform and cooperation among European PSIs, but most importantly calling upon institutions to "foster student-centered learning as a way of empowering the learner in all forms of education" (European Higher Education Area, 2010, p. 2). Further, at the program level, instructional approaches such as problem based learning (PBL) (Jurewitsch, 2012; Klegeris & Hurren, 2011; Salvatori, 2000) and inductive teaching and learning (Prince & Felder, 2006) foster the development of problem solving and inquiry skills in real-world contexts. Medical schools in Canada were among the first to use PBL as a core instructional approach and since then, "the PBL methodology has spread to a variety of different content areas ... and is practiced in many universities and colleges around the globe" (Klegeris & Hurren, 2011, p. 403). In a recent review of the literature, Spronken-Smith and Walker (2010) found that inquiry-based learning was gaining in popularity across many academic disciplines. Although these instructional approaches foster critical-thinking and problem-solving development in students, not enough has been done to move the locus of control to learners when it comes to how they access their courses – potentially one of the many reasons why MOOCs are so popular. One of the salient features of the MOOC phenomenon is how learners can engage in a large open course community where they often learn more from peers, while being supported by a team of one or more university professors and teaching assistants. However, one of the most challenging aspects of MOOCs is attrition and accreditation, as the majority of learners will either drop out of the course entirely or complete the course without any transferable postsecondary credits (Daniel, 2012; Hill, 2013; Jordan, 2013). Some argue that despite these issues, the clarion call of MOOCs is "disregard the dropouts and celebrate giving huge numbers of people access to free, high-quality, education" (Gee, 2012, para. 19). An examination of current university offerings reveals a dichotomy in which students are currently able to access courses: (1) on-campus face-to-face; or (2) online using a mixture of synchronous and asynchronous technologies. Dissatisfaction, lack of incentives for developing and teaching online courses, and the perception of online courses as poor quality are commonplace in brick-and-mortar universities (Parry, 2009; Seaman, 2009). A recent study of 10,700 faculty members across the United States conducted by the Sloan National Commission found that "over 80 percent of faculty with no online teaching or development experience believe that the learning outcomes for online are 'inferior' or 'somewhat inferior' to those for face-to-face instruction" (Seaman, 2009, p. 6), despite considerable evidence in the literature refuting these beliefs (Tallent-Runnels et al., 2006; Ward, Peters, & Shelley, 2010). As a result, most brick-and-mortar PSIs continue to offer a majority of their courses face-to-face, resulting in the limiting of access to those individuals within the geographical and temporal regions surrounding the institution offering those courses. Further, for those PSIs that do offer online options, those courses are often one-off courses within the context of a traditional program, thus contributing to the inflexibility faced by learners as they are unable to access the full array of courses required to earn a credential (Parry, 2009). These programs and their institutions often claim high hidden costs associated with offering a complete online program, a lack of administrative support structure, and the changing role of faculty members (Neely & Tucker, 2010). According to Neely and Tucker, "significant per course costs that are often unaccounted for in university budgets ... include leadership and support ... in coordinating the design, development, and implementation of new courses" (p. 28). A finding also supported by earlier work by Robinson (2005) is that "there are significant labor and technology costs in building a quality online course. In some cases, this initial cost can be enough to dissuade a real commitment to quality online delivery" (p. 180). These upfront design and development costs can be costly as was the case when the University of California Online took a single $6.9 million USD loan to do so (Farr, 2013). All of these factors are arguably why some online courses offered at brick-and-mortar PSIs are often for courses that have higher demand, since it is easier to justify the cost of design, development, implementation, and support of these courses. These factors may also limit the likelihood of niche and highly specialized courses required for students to complete credentials because those courses often have lower potential enrollment and therefore do not receive consideration as online offerings. Because of this dichotomy in offerings, the flexibility that students require to complete credentials increases the risk of restricting access to postsecondary education to only those who can either afford full-time schooling or have minimal other commitments. For example, in Canada, the typical college student is between the ages of 17 and 27 representing over 75% of the student body, and over 90% of postsecondary students are under the age of 40 (Dale, 2010). Given these demands, this research explores a way in which it might it be possible to offer specialized course offerings, while maintaining quality, keeping costs down, and enabling access to remote learners, thus accommodating students with varying temporal, familial, monetary, and geographic characteristics. Customization of higher education for personalization of course delivery has much more potential for disrupting the status quo on campuses than currently recognized. The authors posit that the brick-and-mortar PSI is a "sleeping giant" in the world of online learning as evidenced by the popularity of MOOCs being offered by more traditionalist universities (e.g., Harvard University, Stanford University, University of Toronto) through various means. The authors provide a theoretical foundation for why learners are choosing MOOCs and why it is important for PSIs to support this type of learner. A multi-access framework for learner choice is introduced as a method to provide traditional PSIs a means to support a variety of learners and provide the opportunity to "open" their on-campus courses to the MOOC phenomenon. Findings from a multi-access pilot study are shared, providing preliminary evidence for the framework as a method of supporting learner choice in access to educational opportunities. The quote above comes from a chapter by Ann L. Brown and Joseph C. Campione in an edited volume entitled Innovations in Learning: New Environments for Education. The 20th century saw great strides and changes in understandings and theories of how people learn, from behaviorist beginnings in animal research to the cognitive revolution. The recent emergence of numerous ubiquitous technologies enabling students' choice in personalizing their learning experiences has encouraged students to become more active agents in their own learning. As a result, research on how people learn in learning communities is finally becoming embedded into mainstream practice. Environments that foster lasting learning in collaboration with others in the community, whose interactions are as much a matter of collective understanding and shared experience, comprise the Fostering a Community of Learners (FCL) model (Brown, 1994; Brown & Campione, 1994). FCL research has particular relevance in framing the popularity of MOOCs as a medium for learning. Although much of the work that Brown and Campione did in FCL was with children, if one subtracts the what of learning (the domain of study), aspects of this model remain quite salient when speaking about MOOCs. Of particular relevance is the emphasis on the where and how of learning, the situation – the collaborative culture within which learning takes place. FCL environments are designed with the intention to promote critical thinking and reflection underlying the multiple forms of higher literacy such as writing, argumentation, and technological sophistication. FCL environments are by nature a "system of interacting activities" that engage students in principles of research, in order to share information so they can perform a consequential task (Brown & Campione, 1994, p. 293). Based on this approach one may also draw considerable parallels to the later work of Wegner (1998) and Lave (1996) on communities of practice. Of course, this research–share–perform process cannot be done without considering the specific learning principles underlying FCL environments that research has shown will support successful experiences for students. Jerome Bruner summarizes four critical ideas underlying FCL in his landmark work, The Culture of Education (Bruner, 1996): agency, reflection, collaboration, and culture. The first of these is agency, where learners take control of their own cognitive activity. The second is reflection, where students attempt to make what they learn make sense, often referred to in more recent literature as a critical feature of self-regulated learning (Boekaerts, Pintrich, & Zeidner, 2000; Brown, 1987; Winne & Hadwin, 1998; Zimmerman, 2000). The third is collaboration, where individuals work together in the teaching and learning context. Finally, the fourth is culture – the way that we construct, negotiate, institutionalize, and make it "reality" (Bruner, 1996, p. 87). Each of the aforementioned ideas, or principles, is actively being explored in the research literature across multiple domains and contexts. However, as Bruner argues, agency, where learners take control of their activity, is the first and most critical feature of FCL. As agents and social beings, humans make decisions and enact them on themselves and their environment. Thus, agency arises within social structures and contexts, and once emergent may exert influence capable of altering social, cultural, and structural contexts (Bandura, 2001, 2006). A model of agency for learning (Code, 2010) proposes that the emergence of learner agency is manifested in student choice and abilities to interact with personal, behavioral, environmental, and social factors specifically relevant in the learning context. Within this context, learner agency can be enacted through three different modalities: personal, proxy, and collective agency. Personal agency is the ability for students to choose to originate action (Bandura, 2001). Proxy agency is a socially mediated mode of agency through which individuals choose to have others to act at their will to secure outcomes they desire (Bandura, 2001, 2006). Collective agency relies on people's shared beliefs in their collective power to attain desired outcomes; it enables people to act together on a shared belief through interactive, coordinated, and dynamic means (Bandura, 2001, 2006). Building upon the ideas of FCL, where environments are intended to foster lasting collaboration with others in the community, it is critical to this model whether learning environments enable students to choose how to best meet their learning needs through self-directed, proxy, or collective forms of teaching and learning. The authors hypothesize that it is learner agency that is the primary reason why enabling student choice is critical for 21st-century learners. Further, the authors also argue that learner agency is likely one of the reasons why the MOOC phenomenon has garnered so much attention. Multi-access learning is an opportunity to meet both student needs for access to learning experiences and faculty needs for graduate student recruitment (Irvine, 2009; Irvine & Code, 2011, 2012; Irvine & Richards, 2013). Irvine defines multi-access learning as a framework for enabling students in both face-to-face and online contexts to personalize learning experiences while engaging as a part of the same course. Multi-access learning is different than blended learning because it places the student at the center of the learning experience as opposed to the instructor or the institution. Further, "blended learning" is a problematic term due to its multiple interpretations in the literature and in daily practice, leaving one to ask, "Who controls the blend?" When and where the face-to-face sessions occur and when and how the online synchronous or asynchronous sessions occur are often controlled in blended learning settings. At the core, the institution or instructor is in control of the blend, no matter the configuration. Multi-access learning, however, has the learner at the center, with the ability to choose how he/she wants to access the course. The core principle of the multi-access framework is one of enabling student choice in terms of the combination of course delivery methods through which the learning environment is accessed; that is, each individual learner decides how he/she wishes to take the course (e.g., face-to-face or online) and can then participate with other students and the instructor – each of whom have their own modality preferences – at the same time (see Table 1). To illustrate, each configuration of the multi-access framework will be discussed in detail relative to supporting the various preferences illustrated in Table 1. Note. F2F = face-to-face; "Blended" refers to a mix of consecutive face-to-face and online activities; BOL = blended online (mixing synchronous and asynchronous online activities). The trademark of so many PSIs is the face-to-face classroom. That it is synchronous only needs no explanation. Face-to-face learning comes in many different enrollments ranging from small seminars to computer labs, large classrooms to large lecture halls. The synchronous, on-campus, face-to-face nature of this delivery is the central focus of most of the brick-and-mortar PSIs. This is represented as the "core" in Figure 1. Since it is highly unlikely that this "traditional" model will become obsolete and brick-and-mortar campuses may be unlikely to offer parallel online programs in this period of fiscal restraint, to support the demands of remote students and to increase flexibility, expanding these classrooms to support different modes of access are possible. To do this simply would be to enable the multi-access framework through a combination of tiers as described below. Tier 2 multi-access learning has synchronous connectivity for online learner access. Learners on campus are together in a multi-access enabled classroom and have the instructor present in the classroom with them. Remote learners participate by joining in via Internet webcam and content can be exchanged between participants using desktop sharing. Additional sites of face-to-face student "pods" may also be included in this design provided the technology is sufficient to capture group video and to zoom in as required to points of interest or to share content as required. The next layer of Figure 1 represents Tier 2 synchronous online access. The pilot study reported in this article involved a multi-access learning design including Tiers 1 and 2. Future research will be conducted into how the third asynchronous access option can be incorporated without compromising the quality of the learning experience. If there is a requirement for students to access the courses outside of scheduled meeting times, then the multi-access framework may be expanded to include asynchronous technologies adding a third tier to this access framework. Tier 3 multi-access courses include those who are accessing the course asynchronously. The third layer of Figure 1, the asynchronous online layer, represents Tier 3 of the multi-access framework. Having an asynchronous access to archived synchronous learning events may be a suitable alternative for those who are unable to attend synchronously. Recent research suggests that students who only listened to asynchronous recordings of lectures (podcasts) were able to achieve significantly higher exam results than those who attended classes face to face (McKinney, Dyck, & Luber, 2009). That said, watching archives is often considered a poor form of learning design, so careful attention will need to be paid to how multi-access gets extended into utilizing the third tier. It may involve a mixed synchronous/asynchronous class so there is overlap in the way the whole class can connect. To move the asynchronous group beyond simply watching archived class videos, learning design will need to address student collaboration and co-construction of meaning. Separate personalized synchronous student-led or teaching assistant-led sessions for a pod within a different time zone could also be established. For example, a Tier 3 design may involve synchronous students in Tiers 1 and 2 having a mix of synchronous (Tiers 1 and 2) and asynchronous (Tier 3) course access, creating an overlap between the Tiers so students across the entire class can participate. 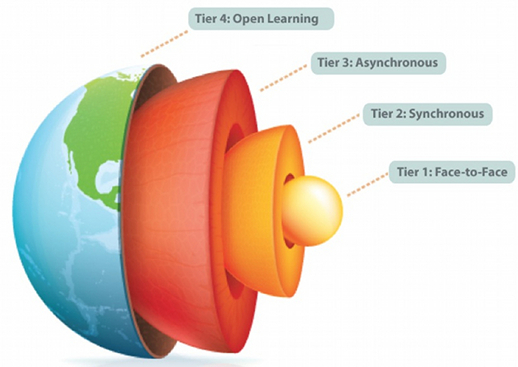 Further extending upon a combination of tiers, Tier 4 would encompass opening enrollment – to global participation; Tier 4 is represented in Figure 1 as Open Learning. Tier 4 multi-access is the extension of enrollment to non-credit students effectively "globalizing" the learning experience encompassing open learning and MOOCs. The interactivity levels required in each of the Tiers will influence the type of MOOC that is capable in the four-tier mode. For example, a course that is more content or lecture-style oriented is analogous to an on-campus large lecture course, where content mastery is the main learning outcome; this would be referred to as an xMOOC in the open education domain (Rodriguez, 2012; Siemens, 2012). Whereas a course that requires more student–student interaction around a subject domain (seminar or small class) is more connectivist and community-focused, and may suit more student-centered classroom designs; this would be referred to as a cMOOC (Rodriguez, 2012; Siemens, 2012). Other possibilities to create educational opportunities for open learners might include a "fishbowl" design in which learners engaged in discussion are observed by other surrounding students (Sutherland, Reid, Kok, & Collins, 2012) with a certain number of reserved spots for open learners, joining or viewing live streams, accessing class archives, breakout audio or video rooms, and participation through wikis, blogs, Twitter, or text chat. The purpose of this research is to examine how a course involving Tier 1 and 2 multi-access affects the learner perception of quality of learning experience, the importance of choice in the selection of a mode of access when taking a course, and their preferences for learning delivery options. What was the rank order of learner preference for mode of access? How important was it for learners to have choice in selecting access modes? How did the experience participating in a multi-access course affect learner perceptions of quality of learning? A mixed methods approach was selected for this research because "the combination of quantitative and qualitative approaches provides a better understanding of research problems than either approach alone" (Creswell & Plano Clark, 2007, p. 8). An explanatory mixed methods design was chosen because the study focused on quantitative results, while using qualitative data to explain or build on the initial findings and determine whether any issues outside of the survey items influence learner acceptance of multi-access delivery. The follow-up explanations model was employed (Creswell & Plano Clark, 2007) as the qualitative data was collected after the initial quantitative phase. Data was collected using a web-based survey with additional student comments collected through an open response question at the end of the survey. Although follow-up interviews were conducted, for the purposes of this article, only survey and open response data will be reported. In Spring 2012, a petition was signed by approximately 50 students requesting that the final course prior to their practicum be offered online. That course, however, was an intensive discussion seminar on ethics in teaching prior to learners embarking on a three-month teaching practicum. The idea of an asynchronous online course, or even one with the typical voice over slide deck, was simply not considered an option by the instructional team. The instructors were initially reluctant to offer the course online when the idea was first proposed because skepticism was expressed about the quality of an online course in that format, not unlike the findings from the Seaman (2009) report cited earlier. However there was acceptance when the Tier 2 multi-access synchronous mode was provided, as it accommodated the seminar-like design the instructors desired. An emphasis on some face-to-face students being present mixed with video and conversation flow from those remote was of key importance and was supported through the Tier 1 (face-to-face) and Tier 2 (synchronous online) configuration provided. After finding this common ground, the course was then offered with a cohort of 26 pre-service teachers in a secondary education program in Western Canada. Seventeen students participated via desktop video conferencing while the instructor and nine students were in an on-campus classroom enabled with room and cloud-based video conferencing. On the last day of the course, the learners were invited by email to participate in the study, which was approved by a university human research ethics board. A follow-up reminder was sent on the conclusion of their practicum. The invitation contained a link to an online consent form and survey. Participants were compensated $50 CAD for participation in the study. Although this sample size is limited, it is illustrative to the purpose of providing important feedback and evidence to the design of a specific multi-access course. Further, it should be noted that an additional limitation of this study was that the course ran using a student cohort, so the learners already had familiarity with each other. Students completed a 17-question online survey that included demographic information on age, gender, education program, and teaching area. Items also gathered information on student experience with online courses, preferences for course access mode, and open-ended questions. Following the administration of the online survey, additional qualitative data was obtained through multiple interviews conducted with a subsample of the participants and separately with the instructor. From this class of 26 secondary education students, 16 gave consent to participate in this study, including 11 women (41%) and five men (19%) (Mage = 28 years, age range 23-45). Ten of the participants were in the remote group (62.5%), while six were in the face-to-face group (37.5%). Of the 15 participants who provided valid responses, eight (53.3%) had taken an online course before (seven out of 10 women, or one out of five men). Despite the small sample size the results support further investigation. A larger study examining six sections of the same course (N = 180) is scheduled for the 2013-2014 academic year. Students were asked to rank their preference for course modality if they were in the same city as the university they were attending and able to attend classes face to face. The options provided were: (1) face-to-face; (2) online; (3) multi-access in the face-to-face group; (4) multi-access in the remote group; and (5) blended. Of the 15 responses, five responses (or 33.3%) indicated they would choose "multi-access in the face-to-face group" as their first choice. The next most popular first-choice rank was "multi-access in the remote group," with 25% (or four) of the responses. Combining these responses, nine out of 15 or 60% of responses indicated multi-access as the preferred modality. Blended came in third with three responses, face-to-face came in fourth with two responses, and online came in last with one response. In contrast, the lowest ranked choice out of five options was online with nine responses (56.3%). The second least popular modality was face-to-face with four responses (25%). The remaining responses were blended with one response and multi-access (remote) with one response. It is interesting to note the contrast between first-rank and lowest-rank course delivery mode. The lowest ranked modalities represented essentially opposite views with the most responses divided between face-to-face and online. These opposite views appear to become synced as the top two favorite modalities were multi-access options, but just with diverse preferences (online and face-to-face) being accommodated within one mode. Fourteen out of 15 learners (93.3%) had one of the multi-access options (face-to-face or remote) ranked as either their first or second choice. When analyzed using the Friedman test of non-parametric related samples (Field, 2005), the first through fifth ranking of the five delivery modes appears in Table 2. The small sample size is a limitation to be noted with the Friedman test and likely had an effect on the significance of the findings (p = .094). Note. N = 15, χ2 = 7.947, df = 4, p = .094. 1 = first choice to 5 = last choice. Descriptive statistics were used to look at the number one preference by the multi-access group. The remote group with 10 participants had seven (or 70%) of participants indicating the multi-access option was their first choice. Three or 30% chose the multi-access remote group again while four or 40% chose the multi-access face-to-face group. The face-to-face group had chosen responses for first choice almost equally across all delivery options except face-to-face, which had zero responses. Fifteen learners in the multi-access course were asked about the importance of choice of delivery using a 5-point scale, with 5 being "Very important" and 1 being "Very unimportant." The descriptive results are found in Table 3 and Table 4. A cross-tabulation, which summarizes categorical data, revealed that learners who had not taken an online course before were solely responsible for the lower responses of neutral or somewhat important, while all responses by the learners who had taken an online course before ranked the choice of delivery as very important. Interestingly, a strong majority of both remote (seven of 10) and face-to-face groups (four of five) of the multi-access class reported choice of delivery as very important. Note. N = 15. 5-point scale (5 = Very important, 4 = Somewhat important, 3 = Neutral, 2 = Somewhat unimportant, 1 = Very unimportant). Fourteen responses were received to an open-ended question asking how the learners perceived, with all else being equal (same instructor, same course), the impact of multi-access on the quality of teaching and learning. Eight responses (57%) reported they perceived the quality as increased and six responses (42.9%) reported the quality as being the same. A cross-tabulation showed no pattern between response and group membership (face-to-face or remote). Quotations from student comments that serve as exemplars are provided below. Comments from face-to-face learners. The opinion that the quality of learning increased carried on with many other students who were in the face-to-face group, "I commend the individuals who designed and implemented this course. It was extremely successful, and accommodated many students who would have otherwise faced serious challenges regarding their living situations" (Student 6). In this offering, only students with practica outside of the city or province were eligible to sign up as a remote learner, but some learners within the city expressed an interest in participating remotely: "I would have also appreciated the opportunity to choose whether I would be an online or F2F student, even though I reside in [University's city]" (Student 9). No one reported frustrations around accommodating those participating remotely as indicated by this face-to-face learner: "I know that the remote group benefitted from the online aspect of the class for monetary reasons, which I fully support. University is expensive, saving money any way that individuals can, should" (Student 15). In fact, one face-to-face learner pressed the issue of importance of making the multi-access mode available for the professional development of practicing teachers: "I think [multi-access] would be ESPECIALLY important for professional development courses that full-time teachers would want to take" (Student 10). With an increasing variety of access options to postsecondary courses for students, from online to massive open online courses, and an increased pressure to recruit students, future research on learning designs incorporating student choice of how and why they choose to access learning experiences will need to be completed. In this research, all of the students who had taken an online course in the past ranked choice in delivery mode as very important, unlike their counterparts. However, 11 out of the 15 students ranked the importance of choice in delivery as very important, adding evidence to the claim that if students are given the opportunity to be agents in their own learning they will make choices that are aligned with other personal, social, and environmental factors (i.e., flexibility is required for a variety of reasons). Although illustrative, it is recommended that this finding be explored to examine if the experience of taking online courses improves learner agency by providing choice, or if those who already have a strong sense of personal agency and a need for choice tend to take online courses. With regard to learning designs, multi-access learning of varying combinations should be tested with different types of course enrollments on campuses, including those with open registration to determine impact on enrollment numbers, but more importantly examining the impact on the quality of the learning experience from the perspective of the learner. Since there is limited research available on the relationship MOOC enrollment has to the type of group (class versus open learners) and type of community, an examination into learning designs that foster a community of learners and their effects on student learning and retention are recommended. Higher education institutions need to refocus on realigning their educational mandate to support increased access to courses for the 21st-century learner via alternative means. Improved access to learning experiences is one of the shared characteristics between the MOOCs and multi-access learning. However, the unique approach that is the multi-access framework allows institutions to take into account student choice and preferences of access, thus enabling PSIs to extend current offerings. As a result, the multi-access framework can help PSIs potentially increase enrollments from a variety of means through the different tiers of course access. MOOCs are but one of these tiers and would be particularly useful for high-demand courses, but, most importantly, the other tiers will be critical for expanding access for opening up more niche courses and thus entire programs for credit or open access. The authors posit that the multi-access framework has a better business model to offer PSIs. A question to investigate is the extent of scalability of multi-access courses in Tier 2 (synchronous online) and Tier 3 (asynchronous online) when combined with the Tier 1 face-to-face course. The multi-access framework includes various tiers but may be better understood from the perspective of the learner as: (1) face-to-face registered; (2) online synchronous registered; (3) online asynchronous registered; and (4) open learner. The authors argue that the multi-access framework is an alternative approach to the MOOC design for those who want access to higher learning. This begs the question, that with this choice of access mode and its parallel to "traditional" course offerings, could this be extended to allow those who register in MOOCs to also gain PSI credit? With most brick-and-mortar universities dabbling in MOOCs, the results of this study should be of interest. With the shrinking postsecondary student population and the echo generation leaving the common age range of postsecondary students, together with the increase in postsecondary institutions and decrease in funding, new models of learning must be considered. Since university enrollments are facing a declining student population for various reasons (The Association of Universities and Colleges of Canada, 2011; Means, Toyama, Murphy, Bakia, & Jones, 2010; Vedder, 2012), it is critical that PSIs deliver what they promise in offering distributed learning – choices for access to learning and learner-centered designs. The face-to-face, blended, online, and flexible models that are promoted are still limited in achieving learner-centered designs because they control the modality or the blend as opposed to the learner. With the advent of online learning in the late 1990s, the anytime/anywhere mantra taken up by many PSIs was a first step to meeting learner needs for flexibility, for the first time considering the student as a locus of control in the learning environment. Often seen in the marketing "lingo" of promotional materials for such programs is "anytime, anywhere ..." learning, yet PSIs have missed a critical component: learners want to connect in "any way." Brown, A. L. (1987). Metacognition, executive control, self-regulation, and other more mysterious mechanisms. In F. E. Weinert & R. H. Kluwe (Eds. ), Metacognition, motivation, and understanding (pp. 65-116). Hillsdale, NJ: Erlbaum. Brown, A. L., & Campione, J. C. (1994). Psychological theory and the design of innovative learning environments: On procedures, principles, and systems. In L. Schauble & R. Glaser (Eds. ), Innovations in learning: New environments for education (pp. 289-325). Mahwah, NJ: Erlbaum. Robinson, R. (2005). The business of online education: Are we cost competitive? In J. Bourne & J. C. Moore (Eds. ), Elements of quality online education: Engaging communities (pp. 173-181). Needham, MA: The Sloan Consortium. Wenger, E. (1998). Communities of practice: Learning as a social system, The Systems Thinker, 9(5), 2-3. Winne, P. H., & Hadwin, A. F. (1998). Studying as self-regulated learning. In D. J. Hacker, J. Dunlosky, & A. C. Graesser (Eds. ), Metacognition in theory and practice (pp. 277-304). Mahwah, NJ: Erlbaum. This research was supported by the Canada Foundation for Innovation, the British Columbia Knowledge Development Fund, Knowledge North, BCNET, and the Government of Canada Social Sciences and Humanities Research Council (File No. 410-2010-0451).